V neck cardigan: 41-46cm 2 balls, 51-56cm 3 balls, 61cm 4 balls, 66cm 5 balls. 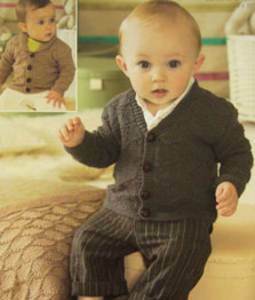 Shawl collar cardigan: 41-46cm 2 balls, 51cm 3 balls, 56-61cm 4 balls, 66cm 5 balls. Blanket 4 balls. 50g balls Sirdar Snuggly DK nylon/ acrylic DK ( shown in shades 427 and 428). DK tension 43st/ 64 rows to 20cm over pattern, 4mm needles. Also suitable Sirdar Snuggly Tiny Tots, Baby Bamboo DK and Baby Speckle DK. 3.25 and 4mm needles, st holders, optional 3.25mm circular needle. 41-51cm 4 buttons, 56-66cm 5 buttons.